Dozens of fluffy shy albatross chicks sitting on artificial nests are a promising sign for scientists behind an innovative plan to give the vulnerable species a boost to help counteract the negative impacts of climate change. Over 100 specially built mudbrick and aerated concrete artificial nests were airlifted on to Bass Strait’s Albatross Island off the northwest coast of Tasmania in July 2017 to trial a program aimed at increasing the breeding success of the shy albatross. Higher air temperatures and increased rainfall associated with climate change are reducing breeding success for Australia’s only albatross, and the rapid warming of the ocean may also make it harder for foraging parents to find prey. Monitoring shows that birds with inferior nests are less likely to successfully raise a chick. Luckily, the artificial nests appear to be working. Endemic to Australia, shy albatross only nest on three islands off the coast of Tasmania—Albatross Island, Pedra Branca, and Mewstone. In some parts of the Albatross Island colony, birds struggle to find and keep sufficient nesting material, resulting in poor quality nests. Conservation scientists and funding partners from the Tasmanian and Australian governments, WWF-Australia, WWF's Wildlife Adaptation Innovation Fund, CSIRO Marine Climate Impact, and the Tasmanian Albatross Fund have worked together to place nests in areas where they were typically of lower quality. Recent monitoring shows that the birds are accepting the nests and personalizing them with mud and vegetation. High quality nests help keep eggs and chicks safe from the harsh weather that hits Albatross Island. Darren Grover, WWF-Australia's head of living ecosystems, recently visited the project site and found that while many of the natural nests had already begun to deteriorate, the artificial nests remained intact. When the chicks are fully grown and about to fly from the island for the first time, scientists will attach tiny satellite trackers to them to capture the movements of their first few months at sea. This will provide crucial information about why fewer juveniles are surviving. As the climate continues to change, scientists need to develop, test, and evaluate new approaches to protecting vulnerable species. 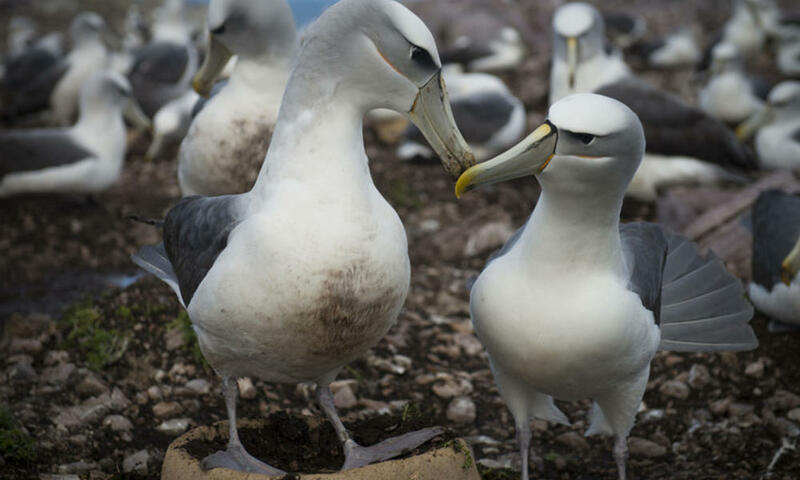 This collaborative innovation is an encouraging step for the future of the shy albatross and can serve as a model for other wildlife recovery efforts. "This is a really innovative project, and exactly the kind of thinking we need if we're to help species adapt in a changing world," said Nikhil Advani, lead specialist for WWF's climate, communities, and biodiversity work. WWF’s Wildlife Adaptation Innovation Fund supports the testing of new ideas through on the ground projects which have potential to reduce the vulnerability of species to changes in climate. Success and lessons learned from these pilot projects will provide useful guidance that move conservation beyond business as usual approaches and rapidly scale promising efforts to help wildlife endure under conditions of rapid change.